OK, so I'm sure most of you that have kids look around their room and wonder why there are so many toys, how to keep them cleaned up, do the kids even play with most of them, and WHY ARE THERE SO MANY TOYS?!?! I know I have lol. Especially with Christmas coming up, and most likely more toys are about to invade the area, we wonder how to get it under control. We don't want to throw it all away because, after all, we paid for those, and they might play with them again some day. So one day I took some advice I heard from someone else. I put about 80% of the toys away, really away. Boxed up, hidden away on shelves, stored out of reach. My 2 yr old doesn't even miss them. I left out a few of his favorites (which is still enough to make a pretty big mess lol). Then you can rotate toys when they start getting bored with them, put the ones out away and get out some of the boxed ones, it will be just like Christmas for them! This has really cut down on the mess, clutter, crowded space, and cleanup time in my boys' room. 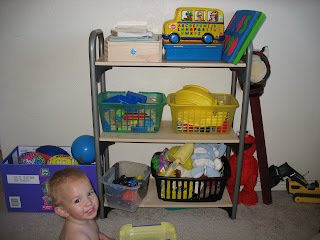 Next is to have some sort of system for storing the toys in use so they are easy for kids to get to, but easy to put away. For me what works best is a small bookshelf, designated areas, and a few containers. Cars go into one container, blocks in a bag, miscellaneous small toys go in another container and everything else goes back in the same spot every time. I also utilize the area under the baby's crib for thing that don't fit on the shelf, like a Tonka dump truck. 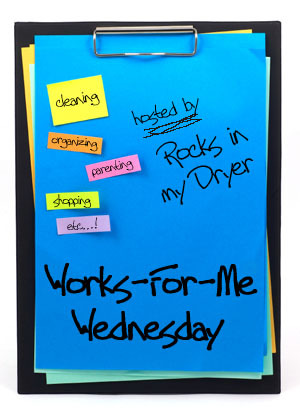 Check out Shannon at Rocks In My Dryer for more great ideas! I saw this the last time you posted it and it is still a great idea and good reminder! Everytime I clean the kids' room I throw out a garbage bag full of stuff. I swear their toys are multiplying. I had to laugh when you posted on my site because at first I thought, "Uh oh, somehow I've posted on my own blog!" Nice to know another Kara and I'm a Sag too! that is exactly what we do, we rotate toys, but there still are TOO much toys out. I'm in the process of doing this right now with my boys. Cute picture of your little one!! Now if I can just find the time to actually store the toys away. They are all sitting in my room. Not sure that's much progress - moving the mess from one bedroom to the next. Ha!